One of the fun things about our daily commute is seeing all of the interesting things that are transported on the back of Bodas (motorcycle taxis.) 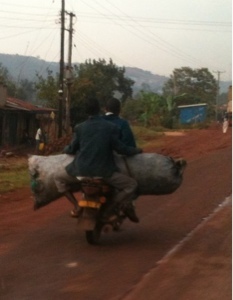 A few days ago I went for run and saw a Nile perch (fish) that was about 5 feet long hanging over the back of a Boda. Since I was out for a run, I did not have my camera for that one, but I do have some photos of things I never would have guessed would fit onto one motorcycle. Here is a whole household, bed, mattress, water jugs and more. - about 20 chickens hanging by their feet over the back. - another Boda, one man driving with another man on the back holding his Boda across the seat. - a family of 6, 2 adults and 4 kids. - a cage with several live chickens. - metal roofing sheets that are about 10 ft. by 4 ft. Here are some more Bodas I have been able to capture in a picture. 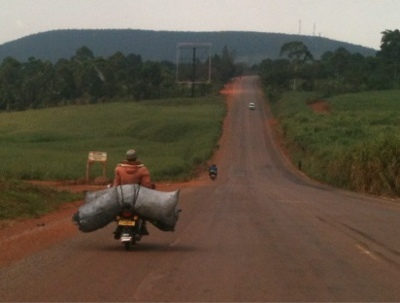 These large sacks are very common, at least tripling the width of the Boda. 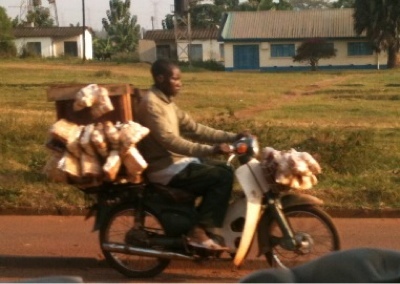 This is apparently a bread Boda. Lunch anyone? And since women all wear skirts here, they ride side-saddle. 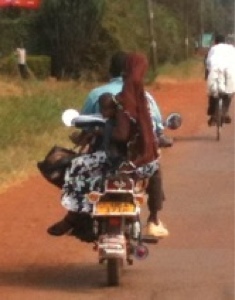 This woman is holding her baby, while sitting sideways on the back of a Boda. This is a very common sight. But often the baby is completely wrapped in a blanket since there is so much dust and smoke on the dirt roads around here. 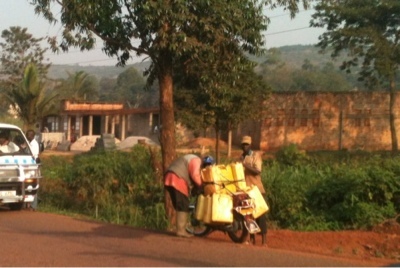 Here some men are loading up a Boda with water jugs. 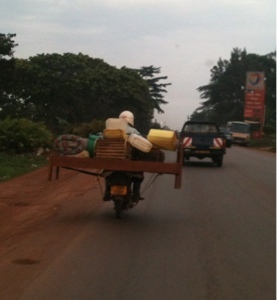 Today I saw a Boda with about 20 of those water jugs, but missed the photo. I never would have imagined that many water jugs could be attached to one little motorcycle, but they were! I love this photo because this was taken on one of the beautiful stretches of sugarcane and tea fields along our daily commute. Uganda is a beautiful country! I will start collecting photos of the beauty of the countryside on our commute for a future post. Feel free to comment with your favorite "on the back of a Boda" photo or sighting. Or maybe you have seen something even more interesting. I heard that someone saw a cow on the back of a Boda, but I haven't seen that one yet. At Kijabe, we saw 4-6 people on one motorcycle. You mentioned also the babies being wrapped up. It was not unusual in Kenya to see babies wrapped in heavy blankets in 75 degree weather. While we were wearing short sleeves, the Kenyans were wearing heavy wool sweaters. It was kind of like visiting Florida.